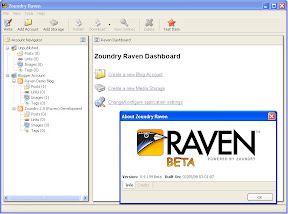 Zoundry Raven is our next generation WYSIWYG blog editor that makes posting to your blogs easier and faster. It's as easy to use as a word processor, plus we include simple tools to add links, tags, photos, music and video files, and more. We hide powerful XHTML editing behind our intuitive UI so you can be sure that what you create is what others will see online. Do you have multiple blogs for different audiences? We make it easy to write and publish to separate blogs all with one editor. With our powerful indexer, you can browse all of your previous posts across all of your blogs by tags, links, or images. Install Raven as a Portable Application on your flash/thumb drive. We'll stay out of your Windows registry and let you take your Blogging on the road. It looks nice, actually, and works with a ton of blogging services as you'd expect.